Blue Ribbon Brides Collection including Seven Medals & a Bride by Angela Breidenbach bestselling Montana author releases Nov. 1, 2016. Be sure to visit the Blue Ribbon Brides Blog Tour reviews and to enter the contest for prizes. If you love historical fiction, and you’re a busy woman, then you will really enjoy the new release event, Blue Ribbon Brides Blog Tour Reviews. As a busy woman, I love writing these 9-1 historical romance collections for Barbour Books because they’re a quick but satisfying read. Anyone can read one story in a sitting, set the book down, and come back to read the next one. 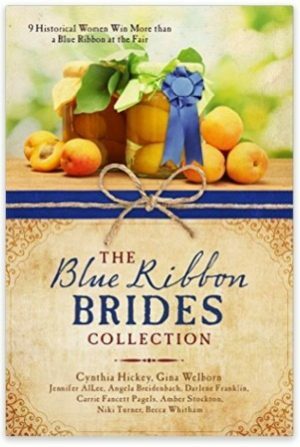 So my favorite way to describe these collections is that they’re the book for today’s busy woman 🙂 Here’s the Blue Ribbon Brides blog tour reviews that Celebratelit has planned so you can see the reviews from busy ladies just like you… (I hear there’s a great contest going on with lots of prizes too! Be sure to enter the contest between Nov. 1 and Nov. 9, 2016. The first story in the collection is Seven Medals and a Bride. In it, I have so much fun sharing the true Montana history that our women won 7 medals at the Columbian Expodition (World’s Fair 1893)! Did you know Cracker Jacks, Shredded Wheat, and Coca Cola had their debuts there? So, so fun to write about it! Previous Article Previous Article: Why are genealogies in the Bible?